Reassembling the Self is an exhibition centred on a study of the condition of schizophrenia, which weaves together art, science, psychiatry and individual histories in an extraordinary exploration of self, perception and the fragility of human identity. The work in the exhibition presents a series of responses to schizophrenia by three artists including two with a schizophrenia diagnosis. Through video, performance, human-computer interface, virtual reality, and traditional artistic approaches, this exhibition explores the mind’s many facets, presenting an expanded field of artistic practice informed by neuroscience. Aldworth, an experimental print and film maker, investigates the transience of self. Her fascination with the physical brain has led to new work which employs techniques from the traditional to the more radical. 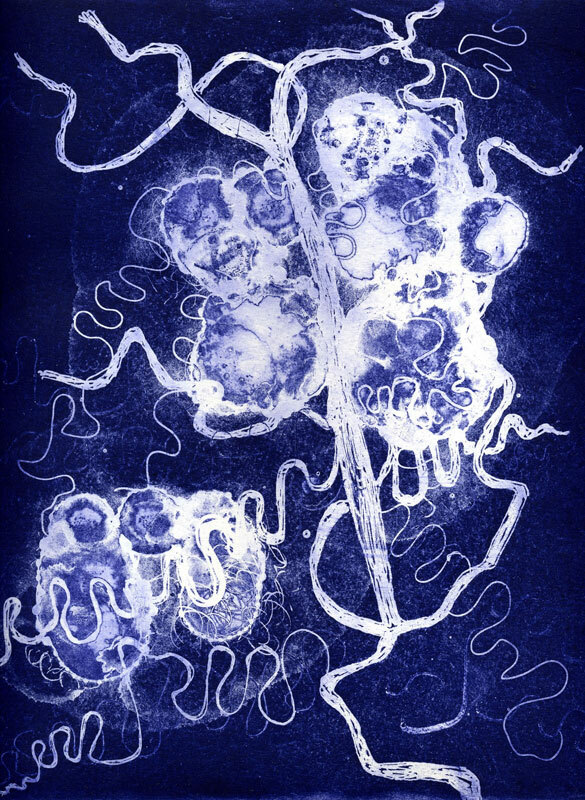 In Transience Aldworth explores the brain as matter – a historical first – etching from human brain tissue. This work has been made in collaboration with Professor David Dexter at the Parkinson’s UK Brain Bank at Imperial College. Blyth Gallery, Imperial College, 5th Floor, Sherfield Building, South Kensington Campus, London SW7 2AZ. The exhibition runs from 8-18 August, 4pm – sunset, St Clements Hospital, 2a Bow Road, Mile End E3 4LL. Local artists, inspired by the poignancy and beauty of a derelict psychiatric hospital and former workhouse , transform St Clement’s Hospital, Bow – soon to be the first urban community land trust in the UK – into a vibrant celebration of compulsive behavior exploring childhood, mutability and society’s perception of normality. The building resonates with its history. A group of 8 artists including Susan Aldworth, Tessa Garland and Amikam Toren, have been given access to this crumbling building prior to redevelopment in an exhibition, COMPULSION, curated by artist Miranda Housden. In COMPULSION they present a series of site-specific installations which respond to the palpable tensions in the abandoned rooms. The transformation of this historic building forms part of this summer’s Shuffle Festival, which includes theatre, poetry readings, and films curated by director and local resident, Danny Boyle. Aldworth, an experimental print and flm maker, investigates the transience of Self. Her fascination with the physical brain has led to new work which employs techniques from the traditional to the more radical. In Transience Susan Aldworth explores the brain as matter – a historical first – etching directly from human brain tissue. You are invited to a lecture by Susan Aldworth. She will share her unique approach to portraiture, philosophy and printmaking. Places are free and are allocated on a first come, first served basis and are subject to availability. Expanding a notion of contemporary portraiture, Aldworth appropriates the illustrative vocabulary of medical science in her innovative printmaking process and in doing so asks how this material corresponds or contrasts with the subject’s sense of self. Produced as part of a commission for Guy’s and St Thomas’ Hospital in Westminster, the portraits by Susan Aldworth in this display depict three individuals with epilepsy. Expanding a notion of contemporary portraiture, Aldworth appropriates the illustrative vocabulary of medical science in her innovative printmaking process and in doing so asks how this material corresponds or contrasts with the subject’s sense of self. Susan Aldworth will lead and participate in related events and lectures during the display’s run at the National Portrait Gallery including a lunchtime lecture on 18 April at 1.15pm. As part of the Salon de Lumière, Aldworth discusses her lenticular prints, which capture flashes of light in the brain – a homage to Man Ray the original ‘Master of Light’. Ondaatje Wing Theatre – Lecture: The Portrait Anatomised. Susan Aldworth shares her unique approach to portraiture and printmaking as she discusses her display The Portrait Anatomised. Susan Aldworth discusses themes of identity, consciousness and representation in conversation with Paul Broks and writer Max Eilenberg. Paul is the author of Into the Silent Land and Max is the one of the subjects of Susan Aldworth: The Portrait Anatomised. York Press’ Arts editor, Charles Hutchinson’s selected Susan Aldworth’s The Dark Self, York St Mary’s, Castlegate, York, as Exhibition of the Year in 2017.